"The Dynamic Earth - an introduction to physical geology"
"Stress" is sometimes used in place of pressure, as stress implies direction. When a rock is subjected to pressure it may not be uniformly applied, there may be more pressure along one or two axis than along all axis. Igneous rocks are coming form a melt, and since liquid is free to flow, it eliminates stress, and the crystals are more affected by the time it takes them to cool. 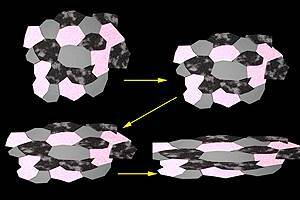 Hence a granite has roughly equi-dimensional crystals. 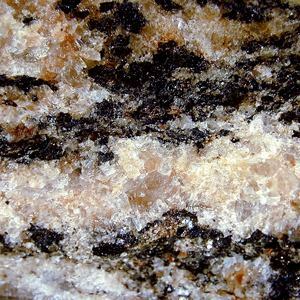 When a granite is re-subjected to high pressure in one direction, the resultant metamorphic rock has the same rough content as the granite, but the differential stress elongates the crystals and aligns them in a direction. 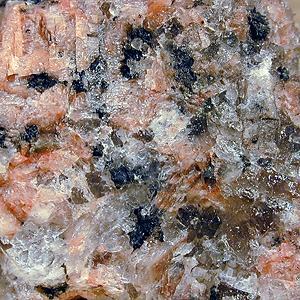 Notice the granite contains grey/white quartz, pink/grey feldspar/ and dark biotite. There is no crystal alignment and the grains are roughly equi-dimensional. After heat and stress in applied, the rock seems to have been "smeared" in the horizontal direction. 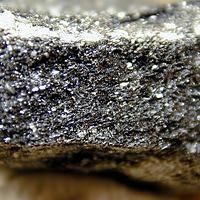 The biotite has more or less aligned to form a semi-banding effect. In this case the stress has changed the alignment of the crystals and not their composition. This is high grade metamorphism as it takes high pressure to accomplish this kind of change. Since most metamorphic events happen under differential pressure, most metamorphic rocks develop directional textures. Those minerals with sheet structures are most easily oriented (mica and chlorites) and align themselves perpendicular to the direction of stress. 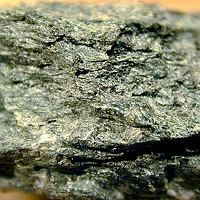 The texture is called foliated, and appears in many metamorphic rocks. Foliation comes from the Greek word "folium" meaning leaf like. This is because many of these rocks split in thin leaf like structures. Fine grained metamorphics are typically products of lowgrade metamorphism and have what is known as a slaty texture. Like foliated, only microscopic in size. 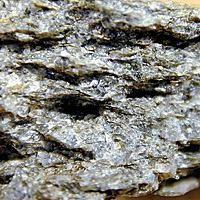 slaty textures break into plate-like structures. Grain size is a direct function of the metamorphic process. Coarse grained metamorphics are those that take a long time to transform, and finer grain metamorphics are those that are changed faster. 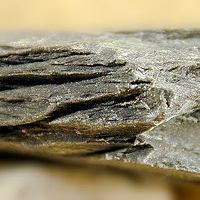 Medium grained metamorphics are called schist form the Greek "schistos" meaning "cleaves easily". 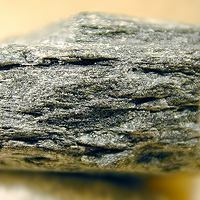 Unlike foliated or slaty, schist breaks along parallel lines, but the lines are often wavy or irregular.